Zoey’s aunt is throwing a surprise wedding, and wants Zoey to make her dress! Can Zoey keep it a secret until the big day? Includes “Sew Zoey” blog posts and fashion illustrations. In the tenth book in the Sew Zoey series, Zoey’s aunt lets Zoey in on a very big secret: She and her fiancé are throwing a surprise wedding! She asks Zoey to make the wedding dress and be a junior bridesmaid. Zoey is so excited about the wedding she could burst—but can’t say a word to anyone except her dad and Marcus. 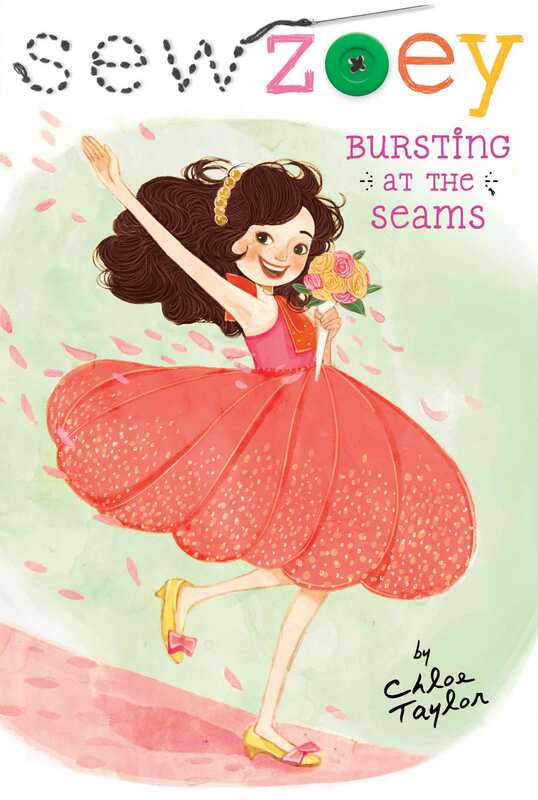 At school, Zoey has some new sewing competition: A boy in her new Home Economics unit is sewing circles around her, and is a strong competitor for a class sewing contest. For the sake of the wedding, can Zoey let go of her desire to win the competition? Hello, readers!! So, remember when the dress I designed for Bryn Allen was on the cover of Celebrity magazine? I do! In fact, it’s hard to forget. Since then, I’ve been getting some e-mails and requests through my Sew Zoey store for more runway looks. I’m not sure that’s my speed, exactly, but here’s a design that could look great on someone young, without showing too much. The problem is that making it would probably take me thirty or forty hours, which is a lot for one dress! I’d need a nice, long vacation afterward. And speaking of vacations . . . my most favorite aunt, Lulu, is finally back in town after a romantic Caribbean getaway with her (dum dee dum) new fiancé! She and John got engaged while they were on their trip. I’m meeting her for tea and cupcakes after school to get all the juicy details. I’m SEW pumped to see her! Zoey Webber was in heaven. She was at her favorite café, Tea Time, with a cup of oolong tea, a pink frosted cupcake, and her aunt Lulu. Lulu was tanned and smiling as she drizzled honey into her English breakfast tea and stirred it with a spoon. “Sounds perfect.” Zoey sighed with satisfaction. The story was exactly what she would have wished for her aunt, who had always been more of a second mother to Zoey since her own mom had passed away when she was very little. Although it had been somewhat hard for Zoey when Lulu and John had first begun dating, because she’d been worried she’d lose her special place in Lulu’s life, that hadn’t happened at all. Zoey felt sure that adding John Chadden to their family would make things even better. With the proposal story out of the way, Zoey bit into her cupcake with enthusiasm. It was Friday afternoon, and a long and busy week at school had made her ravenous. She was so intent on her cupcake, in fact, that she didn’t notice Lulu wasn’t touching her own croissant. When Zoey finally looked up, Lulu was leaning forward in her seat, her eyes bright and her lips clamped together. A smile tugged at the corners of her mouth. “What is it?” Zoey asked. “Why are you looking at me like that?” Self-conscious, Zoey wiped at her mouth with a napkin, in case she was covered in extra frosting. Zoey felt her heart begin to pound. More to the story? Like what? Her aunt was acting very strangely, and not at all like the calm, cool interior designer and business owner that she was. Zoey stared at her aunt, her mouth hanging open. A surprise wedding? What on Earth was that? In three weeks? Zoey’s mind reeled with the possibilities. No church, no big reception hall. No waiting months and months for the big day. A surprise wedding for her aunt, in just three weeks. And she was one of the few in on the secret! Zoey was honored. Truly honored. She’d get to stand up with her aunt at the wedding and help find the dress. It was a dream come true! Design my own junior bridesmaid’s dress? Zoey was flabbergasted. With that final piece of exciting news, Zoey jumped up from her seat and threw her arms around her aunt. What could be more fun? She’d make the most beautiful junior bridesmaid’s dress in the world! Zoey nodded and gave her aunt one more big squeeze before returning to her seat. A really good afternoon for Zoey was a cupcake and conversation with her aunt. Hearing about a wedding proposal made it extra special. Finding out about a secret wedding made it unbelievable. Hearing that she’d be a junior bridesmaid and get to design her own dress? Zoey didn’t have a word for it. Zoey nodded. “I promise,” she said. She had no idea how difficult that promise would be to keep. The next morning, Lulu picked up Zoey, and they drove to a fancy bridal salon. Zoey had never been wedding dress shopping before, and she couldn’t even remember the last wedding she’d attended. Probably her cousin’s wedding when Zoey was about seven. She had no idea what to expect when they walked in. A chic, middle-aged woman in a fitted black suit approached them. “Good morning. Do you have an appointment?” she asked. “Yes, I’m Lulu Price,” Aunt Lulu said. The woman checked a clipboard, nodded, and ushered them back to a large round room, with racks and racks of gorgeous dresses on display, and a wall of dressing rooms on one side. The consultant, Deirdre, gave Lulu a quick tour of the gowns, showing her how they were grouped by price. “And when is your wedding?” Deirdre asked, making notes on her clipboard. With slightly pink cheeks, Lulu explained she was having a surprise wedding at her house in just three weeks, and she wanted something not too formal, but elegant, and that it needed to be ready to purchase and alter immediately. Zoey’s eyes swiveled from Lulu to Deirdre and back to Lulu. What was the big deal about three weeks? Lulu sighed with relief, and she and Zoey headed to the dressing room. Zoey sat, slightly worried. She wanted her aunt to have the perfect dress. She didn’t want her to have to settle for whatever samples or consignment dresses were available that very second. Deirdre knocked and came into the dressing room, her arms full of gowns. They were beautiful, every one of them, and varied from silk chiffon to tulle to lace. Aunt Lulu began trying them on. Luckily, she wore a standard dress size, and was able to fit into most of the samples. The first dress, a strapless silk chiffon with seed pearls and sequins, was too formal for a fall wedding in someone’s backyard. The second, a voluminous ball gown, had a skirt so wide, it would never fit through the front door of Lulu’s house. The third was a possibility, with wide straps, a square décolletage, and a smooth flowy skirt. It wasn’t too formal, and it looked appropriate for a surprise wedding at home. But, unfortunately, Lulu was a bit on the tall side, and the dress was three inches too short, even without heels, and the hem wasn’t quite long enough to let down. “You could cut it and make it knee-length?” Zoey suggested. She was starting to feel discouraged by Lulu’s limited options. Lulu tried on several more dresses, but none of them were right either. Everything was either too formal or fit poorly. Finally, she looked at Zoey, and blinked. “I think we’ve struck out,” she said dejectedly. Zoey’s mind raced. They had to find a dress for Lulu. They had to! Deirdre removed the dresses, and Lulu put her regular clothes back on. She and Zoey left the store, packed with beautiful wedding gowns that wouldn’t be ready in time for Lulu’s big day. “What are you going to do?” Zoey asked her aunt. Zoey couldn’t believe her ears. Her aunt wanted her to make her wedding dress? The most important dress of her life? Zoey agreed. It was sort of perfect. Lulu and Zoey linked arms and then headed for the car. They had a lot of work to do.